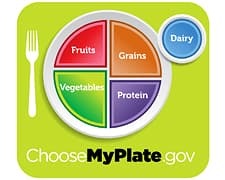 MyPlate replaced the food pyramid. It comes from the U.S. government as a way to picture what to put on your plate. The beauty of MyPlate is in using a plate icon to "measure" the relative portion sizes of what you're eating.et. Eating the MyPlate way means filling half your plate with vegetables and fruits, adding slightly more veggies than fruits. Go for a colorful mix. You'll get plenty of nutrients that way. You should fill the other half of your plate with lean protein and grains, using slightly more grain than protein. Whole grains should make up at least half of your grains. That means choosing brown rice instead of white rice, for instance. The MyPlate icon also shows a glass of milk near your "plate." It's a reminder to include dairy (mostly fat-free or low-fat) in your diet. Calcium-fortified soy milk also counts. News release, U.S. Department of Agriculture (USDA). USDA: "MyPlate Background," "Dietary Guidelines 2010." American Academy of Family Physicians: "MyPlate Food Guide."